Hope you enjoyed yesterday’s review of Last Pick! If you did not get a chance to read it, click the link at the top right after reading this. Today I’m continuing my full week of graphic novel reviews with a crazy mature title about a man on a journey to find out what happened to his deceased grandfather and who the strange characters are, surrounding his grandfather’s past life. 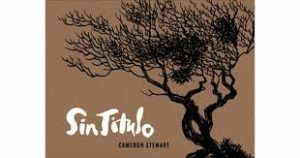 A crime, drama, horror, mystery graphic novel that was originally produced as a web comic, Sin Titulo is not for your classroom; let’s get that right out in the open. I’m not saying that there won’t be a teacher that puts it on their senior level book shelf, but I’d say this one is just for you. Dark and mysterious, Sin Titulo will shake you and leave you guessing until the very end, and then you still might be sort of lost. I mean I wasn’t…pssshh…come on…I’m not confused. But it’s in the way that an avant garde film leaves you: thinking and wanting a second viewing. I will be reading this one again, and I knew that around page 145: the page that most of the plot starts to settle into unstable places. The aesthetic is unsettling: uniform panels coated in a monochromatic brown hue fill horizontally constructed pages. The book is macabre; blood, colored in black ink fills many pages. Yet the violence never felt excessive. It adds to the mystery. This book won an Eisner in 2010 for best digital comic, and it also won the 2009 Shuster Award for outstanding webcomic creator/creative team.